This video shows the processing machines in 1tpd small scale palm kernel oil production line, which includes palm kernel pretreatment machines and palm kernel oil pressing machine. 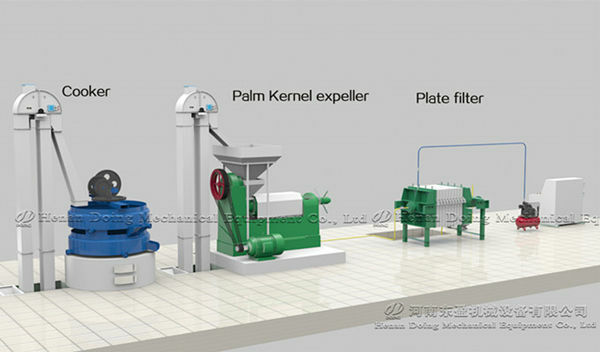 There are mainly four kinds of palm kernel oil processing machine. 1. Palm fiber polishing equipment: to separate palm nut and fiber. 2. 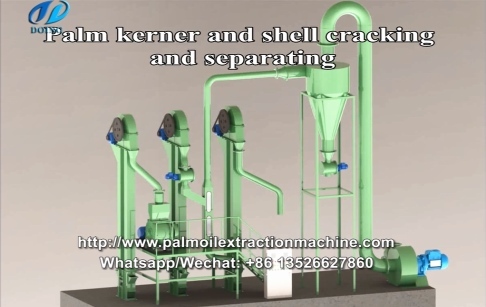 Palm kernel and shell cracking and separating equipment: to separate the palm nuts kernels from the cracked shells clearly and completely. There are two different types with capacity of 200-300kg/h and 1000kg/h as your choice. 3. Small cooking machine: to adjust temperature and humidity of palm kernel so as to extract palm kernel oil more easily. 4. Palm kernel oil pressing machine: to extract palm kernel oil through physical press method. The palm kernel and shell cracking and separating equipment is independently developed by our company. It has five advantages, as follows. In order to manufacture high quality palm kernel oil production processing machine, our professional engineers improved machines and utilize quality material from the authentic vendors to test. In addition, our Doing Company has the advantage to customize palm kernel oil processing machine as per the needs of the clients. 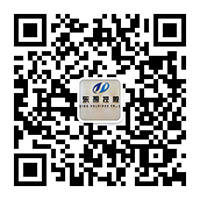 Please fell free to contact us! If you wanna to get more details about 1tpd small scale palm kernel oil production processing machine introduction video you can send E-mail to market@doinggroup.com. You can consult our professional engineer and specialized sales team with leave a message in below form.We will contact with you ASAP.You also can visit our factory in Henan,China.Get Detailed address.